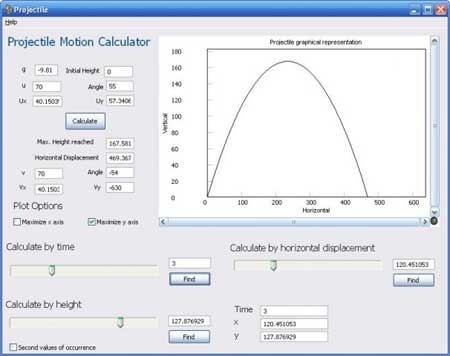 Projectile Motion Calculator. Projectile motion is a GUI based program that calculates various parameters of projectile motion based on initial velocity and height. It also plots the path of the projectile and can also find the location (x,y) as a function of time and vice versa. This entry was posted on March 23, 2008 at 8:53 am and is filed under software. You can follow any responses to this entry through the RSS 2.0 feed. You can leave a response, or trackback from your own site.